The 890 drive supports the Phase Move which is a simple trapezoidal relative move, to the master (it is added to the speed demand). It acts on each rising edge of the Enable input. The slave shaft is moved a fixed distance at a rate given by the Velocity parameter. A move must be completed before a new move will be registered. See Figure 3 for a Functional Description. 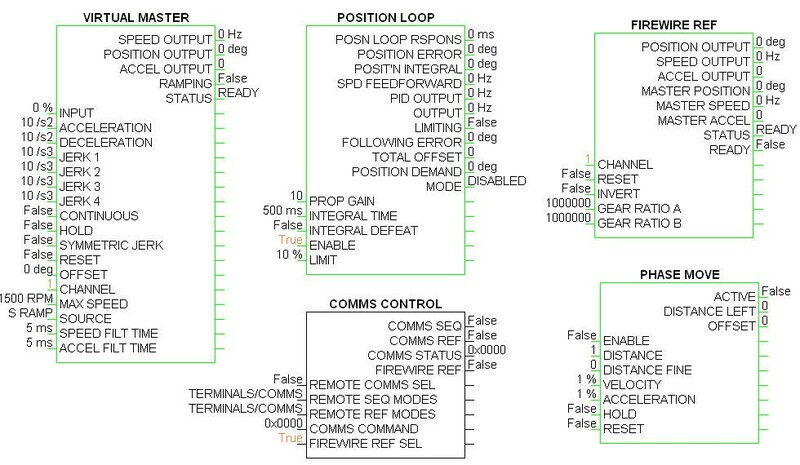 890 Drive operating in the Closed Loop Vector mode and the software DSE890 or DSELite. An Encoder or Resolver must be mounted to the motor, and the 890 drive must be equipped with the proper Feedback option card. A FireWire option card is not required on the drive. Figure 1: Phase Move block. Enable: Starts the Phase Move operation when going from False to True. Setting the Enable to False while a move is Active, will not abort the operation. This parameter is interlocked with the Position Loop block, thus Position Loop / Enable must be True before the Phase Move / Enable goes True. To abort the Phase Move once the operation starts, set Phase Move / Reset to True. When this is done, all Phase Move data will be lost. Distance*: Sets the coarse distance (in motor revolutions) that the move command, will add to the phase loop. The range of this parameter is 3000.00000 to - 3000.00000 (motor revolutions). A negative (-) distance indicates that the motor will rotate reverse. Distance Fine*: Additional Distance to allow fine control of position. The range is 3000.00000 to -3000.00000. 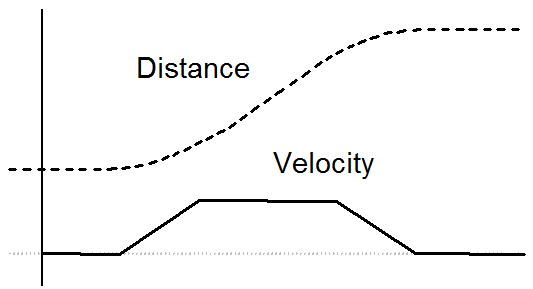 Velocity %*: The maximum velocity at which the distance is added to the phase loop. Velocity is a % of the Max Speed parameter. Thus if Max Speed = 1800 RPM and Velocity = 90%, the actual Velocity = 1800 x 0.9 =1620 rpm. The range is 0.100000 to 300.00000%. Acceleration %*: The acceleration at which the distance is added to the phase loop. The acceleration, at which the distance is added to the phase loop, set in units per second squared. Distance Left: Diagnostic showing the distance remaining before the move is complete. Active: Will be True when the Distance Left is not zero. *NOTE: If these parameters are changed during a Phase Move, the new data will be ignored until the move is completed. In the In the COMMS CONTROL block set FIREWIRE REF SEL to True. In the VIRTUAL MASTER block set CHANNEL to 1. In the FIREWIRE REF block set CHANNEL to 1. To make a phase move, PHASE MOVE / ENABLE must receive a logic True signal. 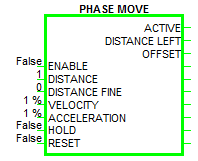 Set the desired Distance, Velocity & Acceleration values, in the Phase Move block. Example: If the Distance is set to 1.0, the motor will rotate 1 revolution when the Phase Move / Enable is set True. Example: If the Distance is set to 100.0, the motor will rotate 100.0 revolutions when the Phase Move / Enable is set True. Example: If the Distance is set to -100.0, the motor will rotate -100.0 revolutions (reverse motor rotation) when the Phase Move / Enable is set True. Start the 890 drive. (Enable Run Forward). When Phase Move / Enable goes True, the Phase Move / Active becomes True, the motor will rotate at the values set in the Phase Move block. The Phase Move / Distance Left will count backward toward 0. When the operation is completed, the Phase Move / Active becomes False and the value added to the Speed Loop from these blocks will be 0. Figure 3: Functional description of a phase move.